The theme for April's Reverse Confetti Stock Your Stash Challenge is moms, dads, and grads. I made a fun congratulatory card for the challenge incorporating the colors from the current CAS Colours and Sketches challenge along the way. 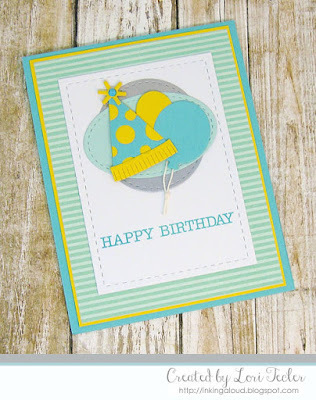 I used RC's Congratulations dies to cut a trio of balloons from cardstock that matches the challenge colors. After adding shiny silver die cut strings to the balloons, I arranged them at the top left corner of a blue cardstock panel, using foam tape for dimension. The "congratulations" and "you did it" sentiments from the Congratulations set were stamped at the bottom of the panel in silver ink, then heat embossed in silver for a nice pop against the dark background. I adhered a red cardstock strip to the bottom of the blue panel, then adhered it to a yellow dotted patterned paper panel. The finished panel was adhered to a coordinating red card base. Here's my take on the current sketch at Freshly Made Sketches. I used one of Lawn Fawn's spring releases in a pastel, spring-like color palette for my sweet design. I colored up the bunny and one of the butterflies from the Butterfly Kisses stamp set with Copic markers, then used my Scan 'n Cut machine to cut out the colored images. It's hard to see in the photo, but I gave the bunny a little texture by adding some white flock to its belly and tail. The images were adhered to a simple sky/grass scene using foam tape. I stamped the butterfly's flight trail on the panel in blue ink that's just a shade or two darker than the background to give a feeling of motion. After matting the panel on purple cardstock to coordinate with the butterfly image, I adhered it to a blue card base over a pair of narrow light green cardstock strips. The set's "you are in my thoughts" sentiment was stamped just beneath the image panel in the same blue ink as I used for the flight trail to finish the card. Here's my card for the current Mojo Monday challenge. I used the sketch to showcase a pretty piece of patterned paper that's perfect for a spring design. I've had this sweet strawberry patterned paper in my stash for a long time. The layout's large panel let me show it off nicely. I matted the patterned panel on coordinating red cardstock, then adhered it to a green card base with a wide light blue cardstock strip along the bottom. 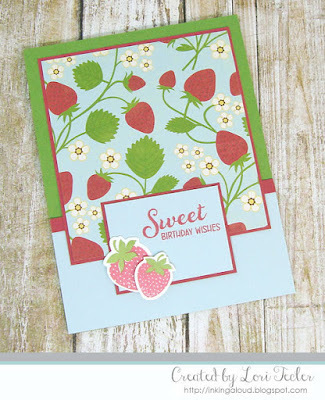 The strawberries from WPlus9's classic Fresh Picked stamp set were the perfect accent for the berries in the paper. I stamped a pair of berries and adhered them to the lower left corner of a small light blue cardstock panel. The set's "sweet birthday wishes" sentiment was stamped to the right of the images in red ink. I matted the panel on the same red cardstock I used underneath the patterned paper, then added it to the cardfront at the bottom of the patterned piece. Always nice to add another birthday card to my stash! Here's my card for the current sketch at CAS(e) this Sketch. This one came together with the Greatest Hits stamp set and coordinating dies from SugarPea Designs. 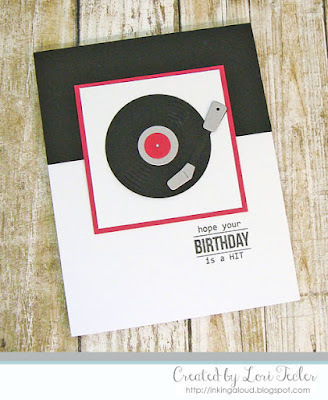 I used black, red, and silver cardstock scraps to cut out the pieces for the record and the record player arm. After assembling the die cut pieces, I adhered them to a white panel, using a bit of foam tape on the record player arm for dimension. The panel was matted on red cardstock, then adhered to a white card base with a wide, solid black panel at the top. The set's "hope your birthday is a hit" sentiment was stamped just beneath the image panel in black ink to finish the design. 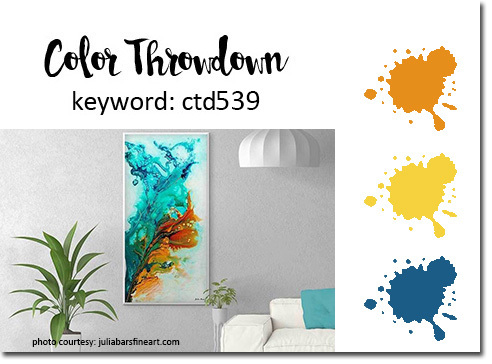 It's time for another Color Throwdown! Vicki is our hostess this week with a bold mix of colors--orange, yellow, and blue. 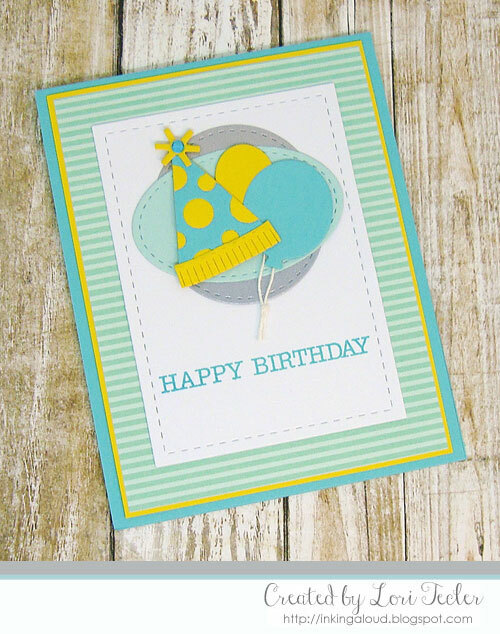 I paired the colors with the current challenge at Sunday Stamps for this birthday themed design. I used a plaid paper from a Halloween paper collection for the trio of panels that run across the cardfront. 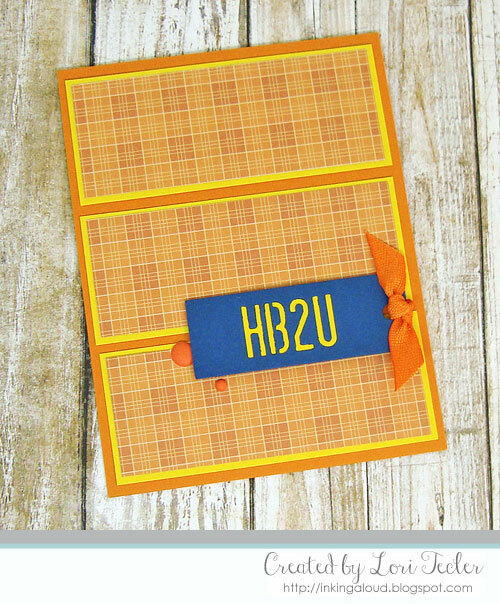 With the birthday sentiment--a blue tag from the My Favorite Things Tag Talk set--it doesn't look Halloween-ish at all! I matted each plaid piece on yellow cardstock before adhering it to an orange card base. The die cut tag, with the negative space filled in with yellow cardstock and tied with some orange twill, was positioned on the cardfront using foam tape. A pair of orange matte enamel dot accents completed the design. To play along, just create a paper crafted project using these colors as a starting point and add a direct link to your finished project using the linky tool found at the end of this week's CTD post. As always, if you don’t have exact color matches, something close works just fine. Just be sure that the challenge colors are the dominant ones in your project. And, if you upload your project to an online gallery, use the keyword CTD539. 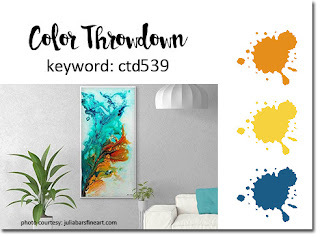 If you upload your projects on social media, go ahead and use the hashtag #ctd539 and #colorthrowdown. You can find us on Instagram and on Facebook with the username colorthrowdown. 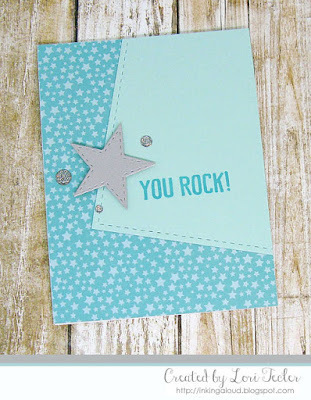 Before you get started, here’s some inspiration from the talented Color Throwdown team, April's Guest Designer, Lee Ann Barrett, and this week's Guest Star Stamper, Lisa Johansen. Here's my card for the My Favorite Things Wednesday Sketch Challenge that ends this morning. I used the layout for a friendship themed design featuring MFT's coffee themed Friends at First Sip stamp set. I colored the coffee drinking gal image with Copic markers, then used my Scan 'n Cut machine to cut out the colored image. The image was adhered to a blue panel with a strip of "sidewalk" at the bottom. I edged the blue panel with narrow strips of red cardstock to match the color of the image's coat before adhering the panel to a pink card base. I planned to stamp the sentiment on three fishtail flag strips and even got as far as stamping the text and setting the strips on the cardfront to test the position. It looked too busy for me, so instead, I stamped a three line sentiment to the left of the image to represent the trio of fishtail flag strips. Here's my card for the current sketch at Freshly Made Sketches. 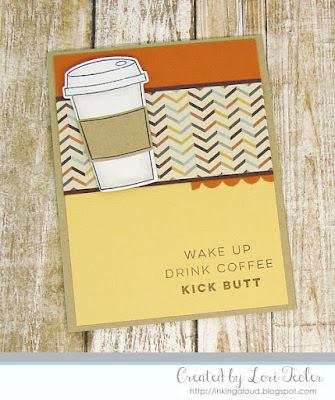 Its coffee theme seems especially appropriate for a Monday morning! 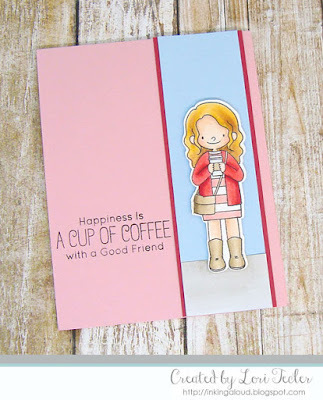 My focal image is the to go cup from Right at Home's Cup of Joy stamp set. The images were stamped on scrap cardstock, then cut out with the coordinating dies. After adding some shading to the images with Copic markers, I assembled the pieces and positioned the to go cup on a strip of earth tone chevron patterned paper at the top of a yellow cardstock panel. To set the patterned panel off from the background, I edged it with dark brown cardstock. A strip of rust cardstock was tucked above the top edge of the patterned panel and a small strip of scalloped cardstock was positioned beneath it. I stamped the set's encouraging sentiment at the bottom of the yellow panel in brown ink, then adhered the panel to a coordinating kraft card base.